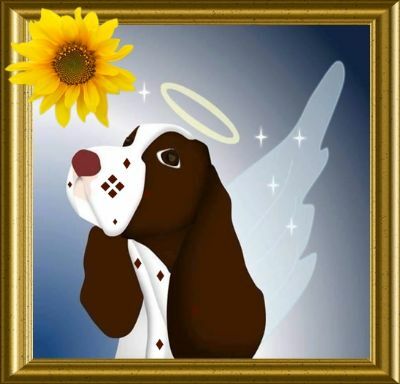 My heart ♥ dog Rugby is now running free over Rainbow Bridge & dearly missed. My darling Rugby was the first English Springer I owned & we were so impressed by him & his 'kind' ~ he is considered responsible for our lifestyle & breed changes! Bred by Dr. Lesley Cameron, he had a very impressive pedigree; a classic blend of English & USA Springers ~ it worked out a treat. I simply adored this dog ~ he really was my heart dog & I was devastated when he left for the Rainbow Bridge. Many other beautiful & much loved dogs came before & since ~ but he was & always will be that special 'one' to me. Until we meet again my dear friend run free ................................ RIP.